North Dakota Department of Transportation (NDDOT) snow operators have been working hard since early morning hours and throughout the day. NDDOT plows are being pulled from state highways this evening in eastern North Dakota. Blizzard conditions are expected to continue into the night and snow drifts may be encountered at structures and sheltered areas and additional roadways may become blocked overnight. NDDOT snow plows will resume operation early tomorrow morning. Plows will continue to operate overnight on the highways in the Fargo metro area. 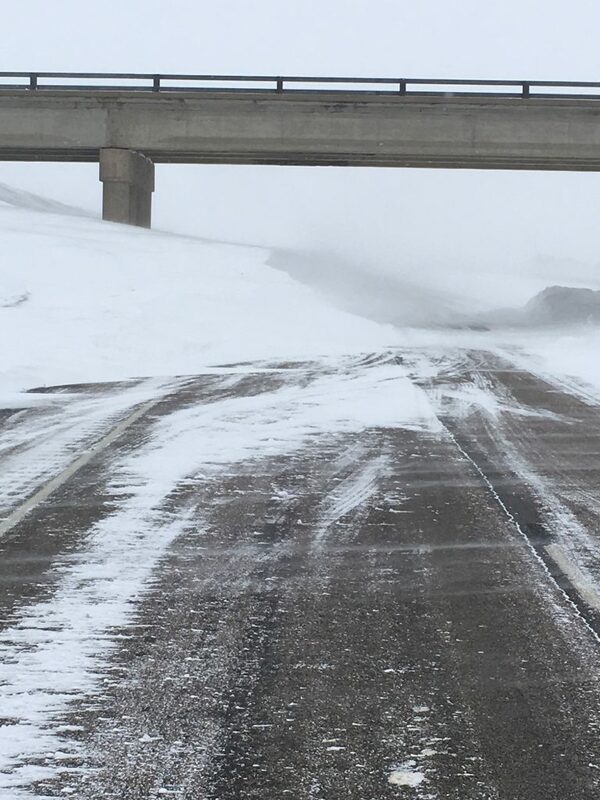 Picture taken 2/7/19 shows drifting snow at an overpass on I-94 west of Fargo. I-94 eastbound lanes CLOSED from Jamestown to Fargo and I-94 westbound lanes CLOSED from Fargo to Valley City. Road Closed means motorists are not allowed to travel on a closed road due to life threatening conditions. The road may be impassible or blocked. Motorists who drive past a road closure device may be fined up to $250. A No Travel Advisory is in effect for all of eastern North Dakota due to heavy snow and blowing snow which is creating near zero visibility and hazardous driving conditions. The No Travel Advisory includes Fargo, Wahpeton, Jamestown, Valley City, Grand Forks, Pembina and surrounding areas. A No Travel Advisory means conditions are such that motorists should not travel in these areas. Roads may become blocked at structures and sheltered areas due to heavy winds. All travelers are encouraged to monitor road conditions as weather conditions occur. For road information, call 511 from any type of phone or go to the Travel Information Map at www.dot.nd.gov. Motorists should check surrounding states for their current road condition information. The NDDOT works hard to keep travelers informed of road conditions. However, the road conditions are not reported 24 hours a day but updated every day from 5 a.m. to 10 p.m. Central Time, including holidays. It’s important to remember that the conditions may vary from what is being reported.